As we saw in the last web log post on how it all works, we can adjust the cable length and thus the delay in the electrical signal to determine which directions will add in-phase (and thus be stronger) and which will add out-of-phase (and hence cancel each other out). Although this is sometimes done by adding more cable, it doesn’t have to be. The only thing that is important is that there is the correct delay. 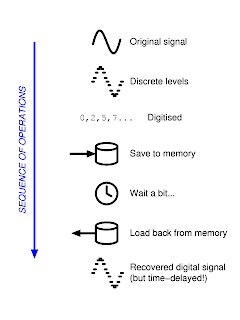 So, instead of using cable, we can digitise the signal and then save the data, wait a little while, and only then load them back again to feed into the adding electronics. 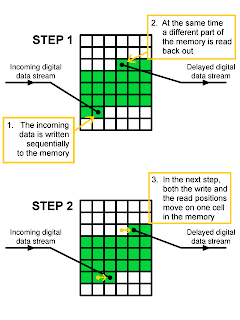 If you are constantly taking digital data and storing them, then it is exactly the same as writing numbers into sequential memory. 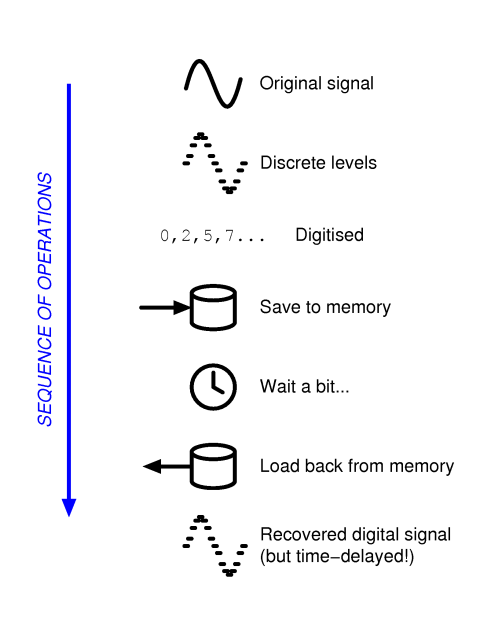 And if you are reading them back out at a fixed delay, then it is the effectively same thing: reading numbers from sequential memory. 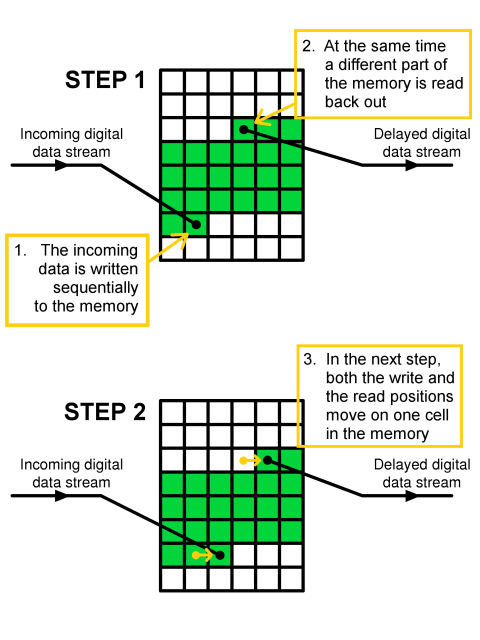 As long as those data are always being written into the memory at a nice fixed rate, and are being read back out again at the same rate, all you need to do is adjust the offset between the write position and the read position and you are controlling the delay. The limitations are that the accuracy at which you represent the incoming wave is a function of the speed at which it is being sampled. Fast memory and fast sampling requires some sophisticated electronics. There is also a limitation that the total amount of delay you can add is a function of the speed at which you are writing/reading and the total amount of memory you have. However, with modern digital electronics, this sort of memory is relatively cheap. Additionally, changing that write-read offset (and thus the delay) can be done very quickly. As a result, you can change the signal delays, and hence the pointing direction of the entire array very quickly. To go from one side of the sky to the other takes something in the order of a millisecond. Try doing that with a 100m radio dish! Alternatively, you can gradually adjust the delay and move the sensitivity of the array quite slowly. This is ideal for tracking celestial sources as they appear to move slowly across the sky due to the Earth’s rotation. However, despite the power of digital signal processing on changing the directional sensitivity of the phased array, there is another benefit as well. Stay tuned!